The Irish-Canadian synth pop of Nightbox wasn't an obvious choice to support Scotland's kings of noisy shoegaze, but the five-piece played confidently right off the bat and had the crowd on board in no time. Comparisons with Bear in Heaven and M83 are clear with Nightbox's electro-acoustic party pop, using a hybrid kit, laptop, Korgs and guitars. The slight Caribbean lilt to "Bears" was infectious, and they later even brought out the cowbell/woodblock combo for a great rave-y jam. There's nothing original being mined here, but it was a impressively tight set and fun to watch, with the group capping it off with that old Shellac trick of everybody playing the kit. 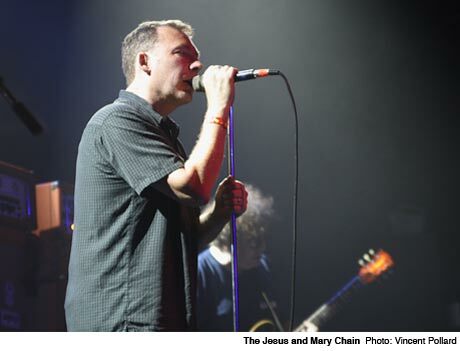 Once the mic check was over and a towel and bottle of Stella had been laid down for each member, the current five-piece lineup of the Jesus and Mary Chain came onstage, with William Reid wearing his customary shades. This might be a reform show, and, sure, the original members of the band aren't in their 20s anymore -- neither were most of the crowd for that matter -- but given that, they sounded great, and their innovative blend of shoegaze and '60s pop still sounded surprisingly fresh. The distorted and flanged guitars still drove their subdued junky sound as a lot of the crowd sang along to each track. With the JAMC shrouded in dry ice and occasional strobes, there were few gaps or wasted moments, the drums -- still at the centre of their sound -- sounding great. In some ways, it's hard to reconcile the anguish of lyrics so concerned with young love and drugs with a band of this age, but on the other hand, the group pulled it off so convincingly that it didn't matter. Canadian actress Jessica Paré joined the band onstage to sing backing vocals to "Just Like Honey" and "Sometimes Always," the band prefacing the latter by stating they don't usually play the song and hoped they could remember it. They messed it up a couple of bars in, to their amusement, Jim Reid offering a quick smile and a "told you" before launching back into the track. The stage lights then went off as they delivered a exhilarating, feedback-laden version of "Reverence," the strobe lights exploding as they hit the first chorus. Coming back on for a three-song encore, the wheels almost completely fell off during third track "Never Understand" as the tempo gradually sped up, leaving some members behind. Just as a cover of the Beatles' "Good Night" started playing over the PA, Jim Reid interrupted it, declaring "We forgot to play a song," and the band broke into a great rendition of "Sidewalking." It all resulted in a solid show that delivered what you'd hope for from a band at this stage in their career. Soaking in the songs live, especially classics like "Head On" and "Happy When It Rains," the mark the JAMC have left on alternative guitar music became strikingly clear.